The Spicket River Restoration Partnership (SRRP) engages the community by utilizing citizen volunteers for water quality testing, establishing a water quality baseline, and further characterizing the environmental condition of the river. We will identify stream channel issues and harmful contamination threats such as storm water infrastructure and combined sewer overflows. Information learned will then be integrated into the larger Merrimack River Watershed Council’s efforts. The ultimate objectives of the partnership include: (1) establishing knowledge and awareness of Spicket baseline conditions, and (2) implementing a Spicket River Water Quality Monitoring Program. 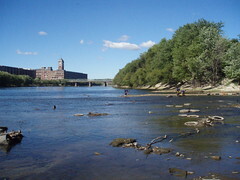 For the project, GWL will be partnering with Mass Audubon and the Merrimack River Watershed Council. 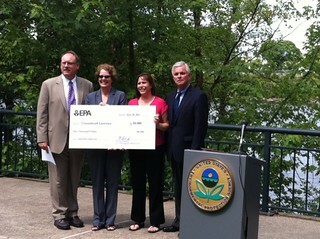 As a part of the Urban Waters Grant Program, the EPA awarded $60,000 to Groundwork Lawrence for the “Spicket River Restoration Partnership”. The grant, one of two given in Massachusetts, is part of $2.7 million that the EPA awarded nationally to 46 organizations in 2012. We are very excited to be among the recipients of this grant program, and look forward to using the grant money to achieve the goals of the Spicket River Restoration Partnership. With the EPA grant, we will establish a water quality baseline of the Spicket River and form a community-based partnership committed to its restoration. Funding from EPA’s Urban Waters program supports communities’ efforts to protect and restore water quality so they can access, improve and benefit from their urban waters. For more information on the program, click here! We are very appreciative of EPA’s support and extend our congratulations to the the Groundwork Providence, New Orleans, and Hudson Valley trusts that also received funding!